Laro Foot Print Gema60 House slippers for women, slippers made with textile materials. Nice and fun design with a mouse and a cat, each drawing on one of the feet so that when joining both feet you can see the complete drawing. They are warm through the soft hair lining. We will have warm feet and walk comfortably through our house. 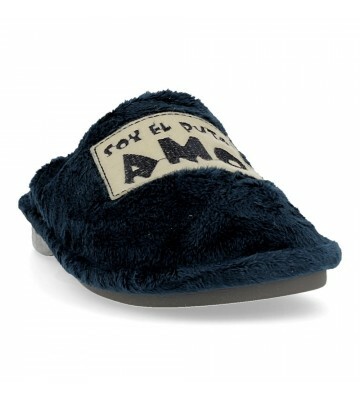 Laro Foot Print Gema78 House slippers for women, undercut slippers made with textile materials. Nice and fun design with a mouse and a cat, each drawing on one of the feet so that when joining both feet you can see the complete drawing. They are warm through the soft hair lining. We will have warm feet and walk comfortably through our house. Calzados Laro is a family company with many years of experience in the manufacture of different types of footwear. They manufacture with great quality both in their materials and in their designs and that is why it is highly appreciated by professionals in the sector. Dare with its cheerful designs and bright colors.